The Pancreatic Cancer Action Network (PanCAN) is dedicated to fighting the world's toughest cancer. In our urgent mission to save lives, we attack pancreatic cancer on all fronts: research, clinical initiatives, patient services and advocacy. Our effort is amplified by a nationwide network of grassroots support. We are determined to improve patient outcomes today and double pancreatic cancer survival. The five-year survival rate has increased three percentage points since 2014 and is now 9 percent. Those three percentage points represent approximately 1,700 mothers, daughters, fathers, sons, husbands, wives, sisters, brothers, colleagues and friends. We have a carefully considered plan of attack. PurpleStride fundraising which will help us raise $200 million by 2020, will help ensure that we’re able to meet these challenges head on. Wage Hope is our rallying cry that expresses the spirit behind everything we do. This is not the “cross your fingers” kind of hope. It’s a hope with teeth. Hope doesn’t always mean action, but action is our middle name. And our hope delivers a plan of attack. We shape policy, mold opinion and firm up funding. We don’t take no for an answer. We deliver a message of hope loud and clear through four key areas. We pioneer and push science forward through our nationally acclaimed grants program, clinical initiatives and the cultivation of a thriving research community. We revolutionize the approach to treating pancreatic cancer by connecting patients with the latest treatment options and providing free, in-depth disease information. We demand federal funding for research and advocate for legislative support by lifting our voices to keep pancreatic cancer at the forefront on Capitol Hill. We lead and activate communities across the globe into a purple tide of humanity that draws greater awareness and funds for the disease. From our beginning as a three-person nonprofit to our role today as the nationwide network supporting the pancreatic cancer community, the Pancreatic Cancer Action Network has made significant progress fighting this deadly disease—thanks in large part to change agents like you. Here are a few of the things we’ve achieved together. 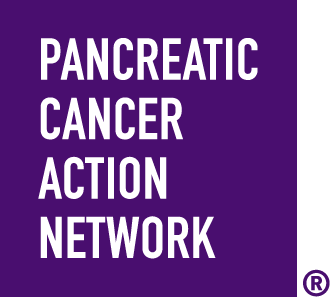 The Pancreatic Cancer Action Network was founded by Pamela Acosta Marquardt, Paula Kim and Terry Lierman. Inaugural One Voice Against Cancer advocacy days held in Washington, D.C. Launched Clinical Trial Finder online tool with access to the most comprehensive and up-to-date database of pancreatic cancer clinical trials in the U.S.